'Suits, Aircrew, Blouse'. Stores reference 22c/391. Size 5 (Ht. 5'5" - 5'6", Ch. 36 - 37", Wt. 32"). By L. Silberston & Sons, 1942 (?) dated. 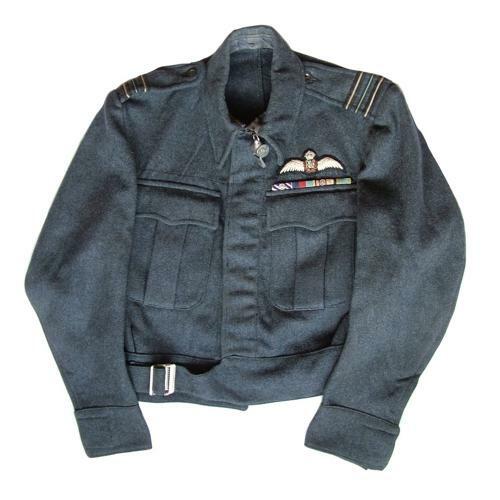 Standard early aircrew battledress blouse with squadron leader rank lace (extra lace added to existing Flight lieutenant rank), lovely padded pilot wing manufactured with silk thread, and ribbons for the D.F.C. and bar, 1939-45 star, Africa star and bar and the Aircrew Europe star. In addition there is an excellent original Air Ministry marked 'ditching' whistle attached at the collar. The blouse looks good and is generally clean and moth free but there is some wear to the 'pile' of the cloth and a small hole on the belt 'strap' and lining near the collar (see photographs). The blouse label is overstamped with the later designation for these blouses 'War Service Dress' and is named to 'P. Cobley'. Peter Charles Cobley, D.F.C & Bar, RAFVR was born in Enfield in March 1923. He flew as a Beaufighter pilot with 272 Squadron in Egypt during 1942 (hence the Africa star) and later served with the squadron in Malta. In February 1943 he was awarded the Distinguished Flying Cross having claimed five enemy aircraft destroyed (although research now seems to suggest that he shared at least one of these and others were actually 'damaged' and 'probables'. In 1944 he was flying from the UK on Mosquitos with 613 squadron. He was wounded by flak during one sortie and another in April 1944 involved an attack on Gestapo headquarters in The Hague. The ninety foot building, stood in the Scheveningsche Wegg and housed the Central Population Registry that included lists of Dutchmen marked down for deportation by the Nazis. The sortie was carried out at just 12 hours notice and there could be no second chance. A flightplan was devised to spring a surprise attack, avoiding the enemy from guessing the intended target, and at a time chosen to reduce the risk to civilians. The squadron flew at low level and attacked the target with delayed action high explosive and incendiary bombs destroying it completely. Bateson, the squadron's commanding officer reportedly said 'we escaped without a shot being fired at us and the Germans had no idea what was happening'. The Imperial War museum in London has the original scale briefing models used for the raid. A good original blouse with an original whistle and interesting history. The rather grainy photograph 13 shows Copley on the right. Stock code U23443.